The Low Level platforms at Stratford were added fifteen years after the high level station opened. The DLR extension to Stratford International will use the track between here and Canning Town. North London Line trains have moved to the Lea Valley high level platforms. The remodelled Stratford station set the standard for future station designs. The former station building (which itself replaced an earlier building) was situated on the left of the photo, where the blue emergency doors are. This view is looking south - the platform area seen here has been reused for the Docklands Light Railway platforms on the Stratford International branch, albeit that the platforms themselves have been located slightly further south to a straighter section of track. Elegant use of glass in the new station. The presence of the actual track seems almost incongruous with the rest of the station. View northward in 2006. The Jubilee Line terminus (opened 1999) is on the left of the photo. Move your cursor over the image to see the area as it was in Sep 2009. Built to serve the area of Stratford for Central London bound trains from North Woolwich (using the Southern Curve which branched off before reaching Stratford station), its usefulness was diminished when through services to Central London ceased in 1940. The location of Stratford Market station, five minutes walking distance from the main Stratford station. View south from Stratford station of Stratford Market station building. The left hand pair of tracks were taken over by the DLR as part of its Stratford International branch. The branch goes as far south as Canning Town.. A new station, Stratford High Street, on the former site of Stratford Market, has been built on the other (southern) side of the bridge. The right hand pair of tracks here belong to the Jubilee Line. Opposing (northward) view of the slight platform and brickwork remains. This is the location where the new DLR Stratford High St platforms start. They were located slightly further south to avoid the curved section of track seen above. 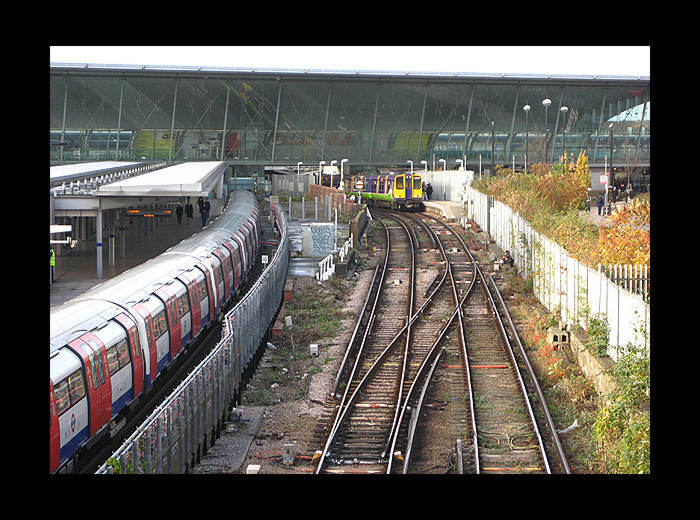 Similar view to the photo above, this one showing the new DLR tracks and the new infrastructure for reaching the new Stratford Market station, which is behind the photographer. Western view of the station building. Widening of the road has left very little pedestrian space in front of the station building.